We apply safe and friendly home treatments to eradicate and prevent Termites in your house, shed and garden areas. Are concerned that your property may have a termite infestation? We use the latest technology and proven prevention strategies to give you a termite-free home. Termites can cause major damage to your home, especially if they are left undetected. That’s why regular termite inspections are highly recommended. Termites also known as white ants, are small bugs with soft bodies. However, these insects are not actually ants. A termite can eat any material that is high in cellulose and colonies can multiply fast. To be able to get rid of them, you have to know how to identify the species and the severity of the infestation. If steps to eliminate termites are not taken as early as possible, they can cause significant damage to the structure of your property. Termite control methods include using bait stations, insecticides and traps. We can determine the best way to deal with your issue after a thorough building and pest inspection is completed. The use of thermal imaging cameras are one of the most effective ways to identify and locate any termite activity. Once we identify the termite, we will then recommend an appropriate treatment plan for you. Inspect the property for termite damage. Setup termite baiting systems in the property. Conduct Annual Termite Inspections for continue prevention & eradication of termites. Remove dead and old wood outside the house top prevent termites from nesting there. Expose Affected wood to direct sunlight if possible. Eliminate sources of moisture in and around the house. Get Annual Termite Inspections from Gawler Pest Control. Each year, It is estimated that the eradication and repair of termite-infected houses costs more than 1 billion dollars in Australia alone. 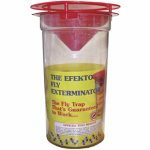 Efector Fly Exterminator is a quick, efficient, all natural and effective trap suitable for use around the house and outdoor settings.